Staff Picks for 2018 are here! How well do you know your literary dogs? I was walking out of a seminar about a year ago when I saw a woman ahead of me who had on a pair of great shoes. I couldn’t help myself. “I love your shoes!” I exclaimed. And she stopped, turned to me, and said “Thank you! My friends don’t like them, but I love them too!” She was so happy and encouraged. It was 10 seconds of my time, but it brightened both our days. This is the power of a simple compliment. Keeping that in mind and taking inspiration from Ben’s Bells Kind Notes (and how stressful the holiday season can be), the Murphy-Wilmot Library recently put together a compliment wall. 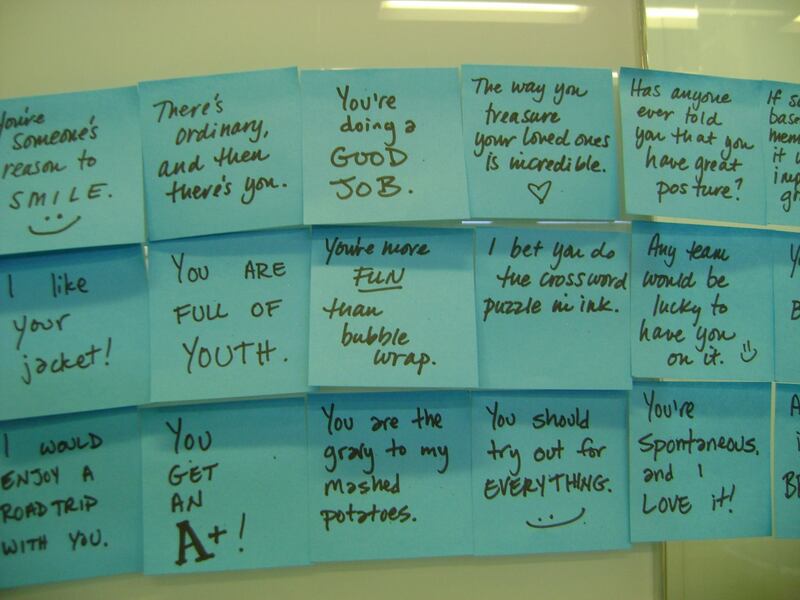 We covered a wall in sticky notes with compliments written on them that people can take – for themselves or to give to someone. Up at the front desk, we put a stack of sticky notes, markers, and a sign encouraging people to write a compliment for someone else and post it on the wall. Of course, it wouldn’t be a proper library display without a pun, so I added a big banner proclaiming “Add Sweetness to Your Day” and Jane made a large paper gingerbread house with candy decorations. 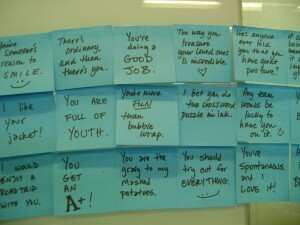 Marisa and I wrote more than 100 starter compliments on sticky notes, laughing and comparing notes. We were a bit silly towards the end, which led to silly and sillier compliments. I’m blaming that on the marker fumes. I’m not going to pretend we thought of all the compliments by ourselves. Like true librarians, we did our research and found websites that had lists of compliments. We also asked some people what compliments they’d like to hear. And we put some up aimed at the parents and grandparents coming in with small children. After all the nice things people said about us during I Love My Library Week, this is our chance to give back to you. Not everyone who sees our display has taken a compliment, but many people have stopped and read the notes. Maybe they’ll be inspired to give compliments to those around them. We all need a bit of encouragement at times. So remember: you’re cooler than pirates and ninjas combined. If you can’t make it in to see our compliment wall, we recommend happier.com’s list of 100 compliments.